Several years ago, I was talking to a customer, who asked whether we could change the color scheme of the EDAX TEAM™ software. He said was that it was hard for him to tell the difference between the spectrum background and the cursor. I replied, “Well, the cursor is a lime green and the background is more like a gray-gre…..Oh, wait, you’re colorblind, aren’t you?” Surely enough he was, and while I can’t “see” his perspective, I can listen to and respect it. Thus, the motivation of this blog is to let our customers know that we in Applications listen to them and take their needs seriously. 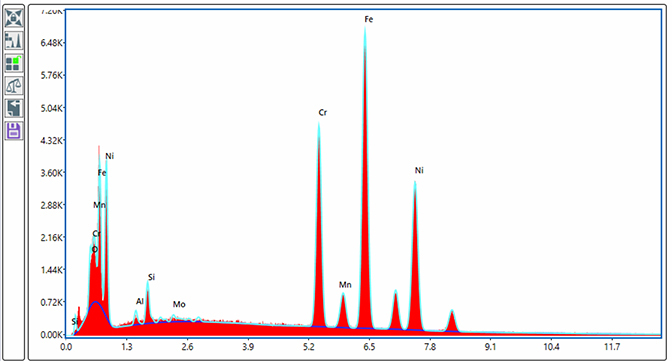 In this specific case, I am happy to report that we just recently received feedback on the new EDAX APEX™ software, and one comment was that the user really liked the “contrast” of the red spectrum on the white background – see the image below. More generally, it is one main goal of the EDAX Applications team to make sure that we capture the “real world” customer feedback and incorporate it as much as possible into future product enhancements, bug fixes and new generations of products. Each of our Worldwide Apps team members can talk to upwards of ten customers a week. These conversations are usually in interactions such as support calls, training sessions and demos. At each opportunity, we hear tremendously valuable real-world customer perspective, and very often we learn what we can’t “see” ourselves. Often, if I’m asked to share my thoughts, my words are just a colorful patchwork of years of customer ideas all melded into a microscopy amalgam. Customer perspective is so important, in fact, that it is a cornerstone of the EDAX App Lab Mission Statement. A few years ago, I compiled about three pages of descriptions of what people thought of when they thought of Apps, and then condensed them down into the following statement that hangs on our HQ App Lab walls. The EDAX US App Lab uses technical expertise and creativity plus a strong focus on understanding the needs of our internal and external customers to drive excellence in innovative analytical solutions. The applications group supports company-wide efforts to provide real-life value and benefits to our customers which differentiate our products in materials analysis. 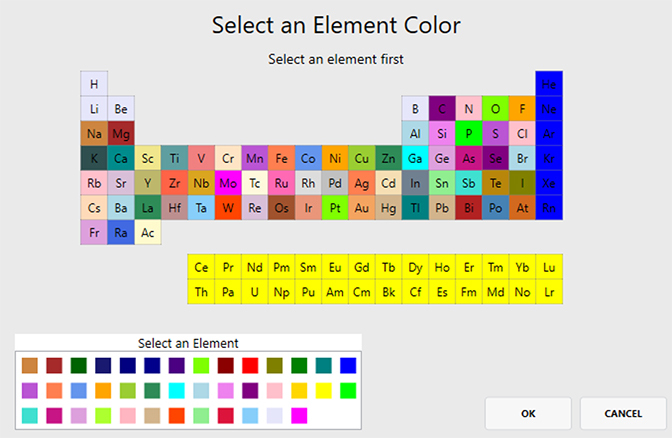 Using this option, you can choose from a 40-color palette, seen here. 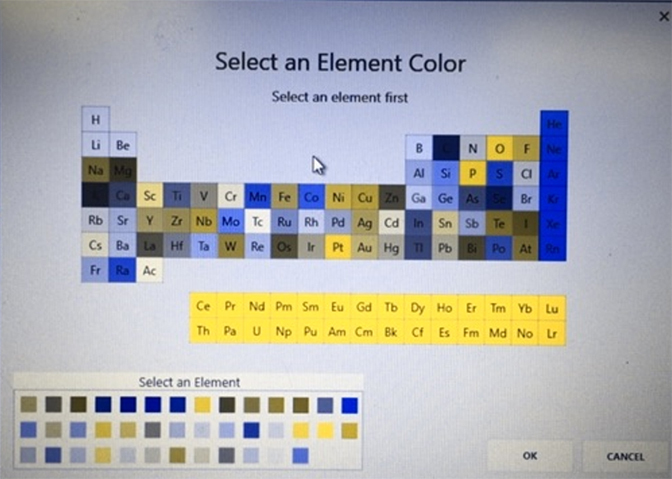 Remember to click on the element in the periodic chart first, then select your color. Since I brought up the topic of colorblindness, I’ll also use a colorblind app that simulates how a Red/Green colorblind person sees the world (or our color palette). Note the green color of O and P, and see how closely it compares to the yellow color of the lanthanide/actinide series! Finally, to summarize the Applications message: to our current customers – thank you for sharing your thoughts; to all our applications team colleagues – thank you for gathering so much wide-ranging information and promoting the importance of it internally, and to all our future customers – when you chose EDAX, you’re choosing to join a dynamic microanalysis company, which strives to develop the most meaningful features and functions to meet your microanalysis needs.